Who’s up for a story? I’m actually a huge fan of children’s literature, and am always up for new ways to tell stories. This is an interesting utilization of iPad technology to perform the ancient art of storytelling. The app is called The Fantastic Flying Books of Mr. Morris Lessmore and it is an interactive children’s book — but it’s also so much more. As soon as you start flipping through the interactive pages of the iPad book, you’re pulled back into the days of bedtime stories and fairytales. At the same time though, you’re perfectly aware of the fact that you’re being drawn into a wondrous narrative by a series of animated clips and interactive cues. If you choose to, you can tap, swipe, swirl, and smash your fingers against your iPad to trigger additional animations and sounds — or you can simply swipe through the book’s “pages” and let the tale unfold as if it’s simply a well-produced short film. more via Gadgetbox – The most stunning iPad app so far and to check out the video of it. Miguel Valenzuela “created a green screen glove out of some fabric and used it to animate a LEGO robot across a table. The green glove was made with green spandex and stitched together with only the thumb. It should really be called a ‘green mitten’ since it has no fingers. I shot the video of the LEGO moving around and then moved it out of the frame. I then let the camera shoot about 20 seconds of background. I imported the video into Adobe Premier and cut it into two segments: the glove shot and the background shot, and layered the glove shot over the background shot. I then keyed out the glove as much as possible and let in the background which matched seamlessly with the foreground. Watch the LEGO dude in action. Until recently the Los Angeles-based choreographer Lula Washington did not use e-mail. Actually, she resisted most forms of technology. Her dance company had a Web site; Ms.Washington just hadn’t visited it. So it’s somehat interesting that a few years ago she found herself working with one of the most technologically innovative directors in Hollywood. Ms. Washington, whose company is celebrating its 30th anniversary this year and will be performing at Peak Performances@Montclair beginning on Thursday, helped choreograph the ritual movement and body language for the Na’vi people in James Cameron’s blockbuster “Avatar.” Dancers in her company also helped provide motion for the characters through performance-capture technology. Ms. Washington, who grew up in the Watts section of Los Angeles, worked with Alvin Ailey and specializes in reflecting the African-American experience through movement. She speaks very softly, but her bright poppy-red lipstick hints at her feistiness and strength. Her new piece, “www.connections.2010,” which is having its world premiere on Thursday, is inspired by the ways people connect and expose themselves through social networking on the Web. The science fiction blockbuster “Avatar” is set on a mysterious alien moon with out-of-this-world technologies. Its star director, James Cameron, has not only directed other science fiction epics like “Aliens, The Abyss” and the first two “Terminator” films, but was apparently the president of his high school science club, a physics major in college and has an engineer brother who has designed underwater robots. So how much science is there in “Avatar”? The movie is set on the fictional Pandora, one of the many moons of a fictional Saturn-sized gas giant, Polyphemus, which is located in the real Alpha Centauri system, which at nearly 4.4 light-years away is the closest star system to Earth. While astronomers have yet to discover moons beyond our solar system, they expect to. And the Alpha Centauri system could be a place worth looking. The larger of the two real, sunlike stars that make up this alien system, Alpha Centauri A, is the fictional Pandora’s sun. In reality, scientists might soon be able to detect habitable moons with the James Webb Space Telescope and also study their atmospheres for key life-related gases such as oxygen, and water vapor. Tropical rainforests cover most of Pandora’s continents, which suggests its mother planet must be fairly close to its sun to take advantage of its light. A few years ago, this might have seemed implausible, but most of the alien planets scientists have discovered so far are in fact gas giants that are exceedingly close to their stars. However, life on a gas giant’s moon might present a host of challenges. Jupiter’s moons exist within an intense radiation belt of electrons and ions trapped in the planet’s magnetic field, and Saturn’s gravitational pull leads to extraordinary tidal effects that may have once ripped apart nascent moons to produce its rings, and today can drive winds and volcanic eruptions on its moon Titan. Five decades before Coraline scared the hell out of moviegoers with its spooky stop-motion storytelling, special-effects pioneer Ray Harryhausen got audiences screaming with his creepy Cyclops creature in The 7th Voyage of Sinbad. 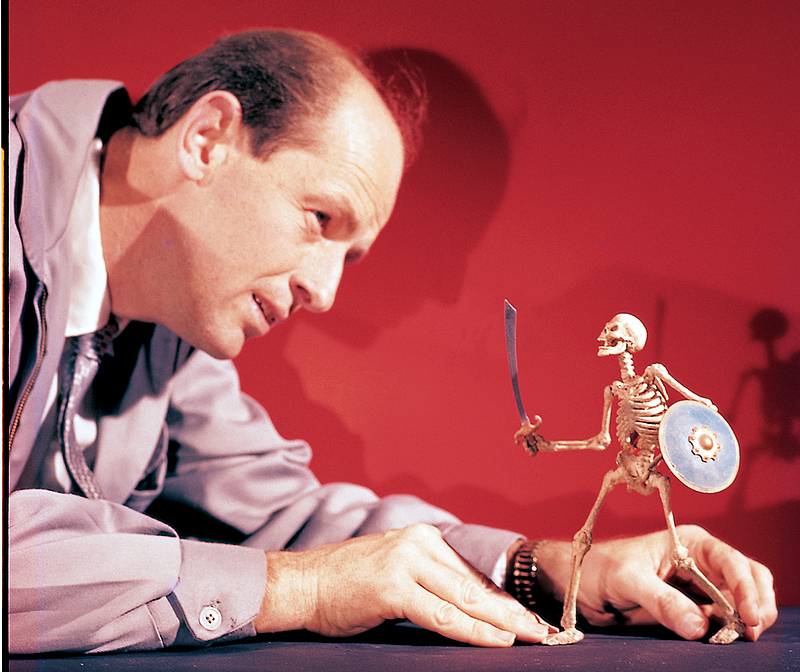 Now Harryhausen, 88, shows how he pulled off the movie magic in a new book titled A Century of Stop Motion Animation: From Melies to Aardman. The picture book offers behind-the-scenes photographs of Harryhausen at work on mythological monsters for films including 1963’s Jason and the Argonauts and 1981’s Clash of the Titans, both of which are being remade for 2010 release.